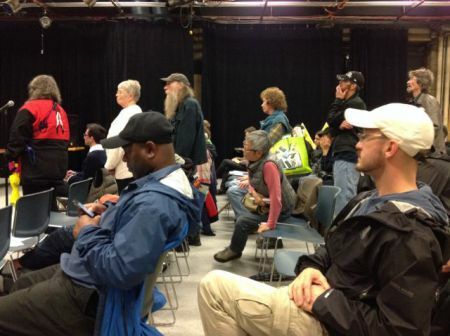 A group of around fifty people showed up at the Carnegie Centre for a 2014 municipal election all-candidates meeting on the afternoon of 23 October 2014. Then varying subgroupings of four were asked to respond to five questions that were formulated from local solicited written input. The two hours left a generous portion at the end for questions and comments from the floor, and it appeared that all who wished to participate had the opportunity. Several comments attracted strong applause. There was no heckling or booing. Sid Chow Tan: Police are doing jobs that shouldn't be done … using order and force against people, not serving people. Police get a bad rap for doing a job that they should not have to do. Niki Sharma: Council [under Vision control] took a landlord to court for the first time ever, and was successful. Audrey Siegl: It's time to stop prioritizing investors and developers over humans. Andrea Reimer: The Local Area Planning Process held 335 meetings. Suzanne Scott: Land is rare in this city. Audrey Siegl: [Re condos] Stacking people up like rats, whether they are rich rats or poor rats. Andrea Reimer: Use developer dollars to build social housing, or use no dollars to build social housing. Nicholas Chernen: Runaway pace to build this city out … call it LARP for Local Area Real Estate Plan. Sid Chow Tan: Woodward's media centre now empty for two years just because we couldn't pay the amenity fee. At one point the controlled format slid toward direct confrontation in a situation that to some degree amounted to an informational point of order. Andrea Reimer tried to excuse the sudden carve-out of Chinatown from the Downtown Eastside by saying she "could not dishonor the ten years" that Chinatown had put into previous process, and that the carve-out had "100% support at Council." Sid Chow Tan intervened to respond that he was at Council and opposed the move, therefore it could not have been 100% support, and he mentioned other names as well. Andrea Reimer then defined the 100% as representing "those involved in the planning process." For speakers at that particular public hearing, the record shows 22 "in support" and 82 "in opposition." Draw your own conclusions from the data. The candidates took a few questions (and statements) from the audience. Most of the responses focused on the DTES LAP. 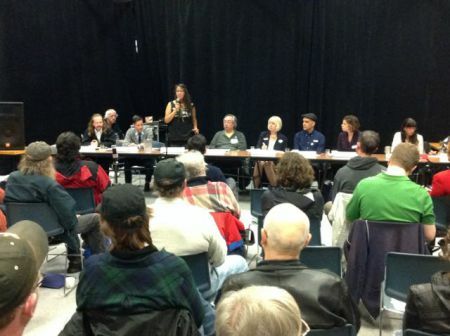 Reimer said that she respected the DTES plan, as it was ten years in the making. Tan disputed the local consensus involved. Vancouver Police Department annual reports show numbers of VPD Sworn Members as a constant 1327 from 2009 to 2013. For total costs of staffing, the 2008 report shows $154,032,000, and the 2013 report shows $195,634,881. The difference of $41,602,881 over five years amounts to a 27% increase. This provides a rough basis for asking, in the current economy, who else enjoys a regular pay increase of around 5% per year? Isn't it a marvel that staffing has been held constant for those 1327 plum incomes? The reoport stated: "Sid Chow Tan: Police are doing jobs that shouldn't be done … using order and force against people, not serving people. Police get a bad rap for doing a job that they should not have to do." This was said in the context that mental illness, addiction and poverty are jobs that are being foisted on the police. Sid – Thanks for elaborating your context. I felt it was implicit. Now it's explicit. All to the good. An election is good if it is held nicely and clearly. And discussion can play a big role in this regard. Glad to see a good discussion here.